Momma Told Me: That's not furniture, it's a choking hazard! I never owned a beanbag as a child. I once dated a full grown man who had 3 in his tiny 1 bedroom apartment, but I, personally, never partook in the craze. Growing up Momma had strictly forbid the pellet filled furniture in our household, though I was permitted a variety of 'inflatable' chairs and couches. I never understood the reasoning behind giving a young adult furniture that could pop or 'leak' at the slightest introduction of a sharp object, but I could hardly complain; as that was what I had. At least it seemed to foster an acute sense of property ownership and maintenance, as I quickly became skilled at adhering patches, and instituting creative repairs. (The first lesson being that BandAids do not stop air based leaks.) But I digress, like waterbeds, bean bag chairs were the craze during my childhood, and still very popular among the gaming and casual furniture consumer today. Regardless of the filling, there is simply something comforting about 'falling' into a material that molds to your every nook and cranny. 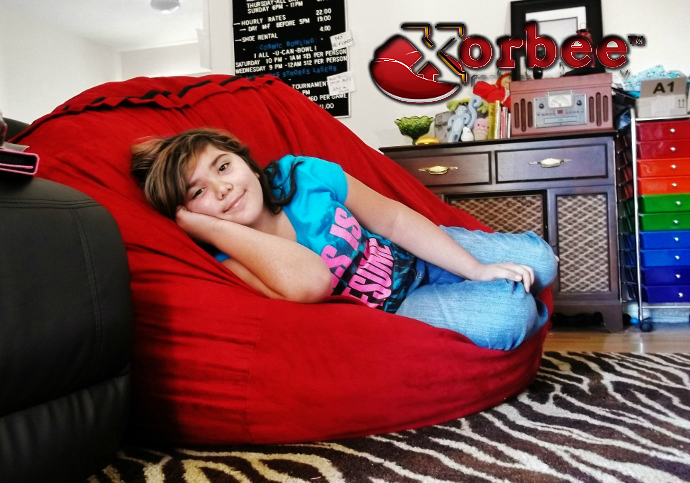 Like most iconic concepts, even the classic beanbag chair has come into the 21st century; though the Xorbee might be a little offended to be compared to such a primitive concept. Similar to so many of my favorite home lounging comforts (bedding, pillows, etc) the Xorbee, line of Foam Furniture, relies on a filling entirely comprised of memory foam. There's a reason FOAM is now universally used in so many high end and luxury products; it's not only durable, but comfortable. Foam, unlike PVC pellet, water, and air based furniture, returns to it's previous state quickly while still providing unmatched support and comfort throughout the entire surface area. Xorbee's unique foam based material also naturally regulates temperature, proving a much better lounger, year-round, and even eliminating the need for heavy blankets and Snuggies. And, should this sack ever tear open you're not looking at water damage or millions of dangerous plastic pellets! I first discovered Xorbee looking for therapy alternatives for an online friend with an autistic range child. 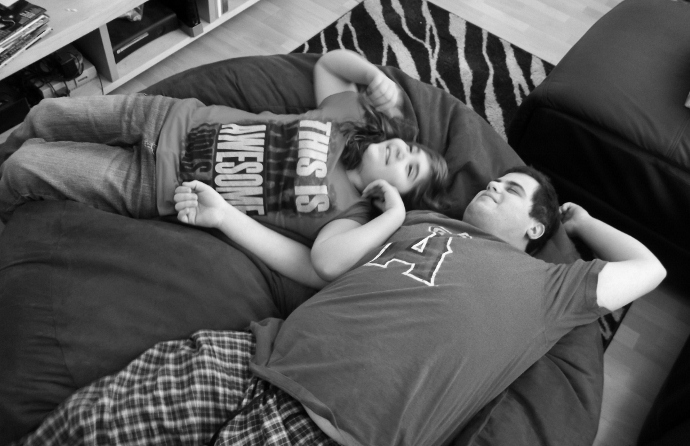 I recalled seeing an amazing blog post about how a 'bean bag' style chair was one autistic child's sanctuary, providing the complete 'cradle' support the child needed to feel calm and in control. However, there provided to be a drawback to the bean based lounge, that never returned to it's form on it's own, and proved difficult for the child to get out of, as well as cold during the Winter nights. To me, this seemed like the perfect solution; but I wanted to get my hands on one of them for my own family! Available in Big Pillows to ginormous Loungers, the Xorbee range fits any budget or space, and outlasts ordinary alternative furniture thanks to the 'self resetting' foam and beautifully crafted. washable, covers. Sold in 12 modern decor colors, in twill or microsude materials, Xorbee covers are the key to ensuring your Foam Furniture investment outlasts even the rowdiest kids and guests. 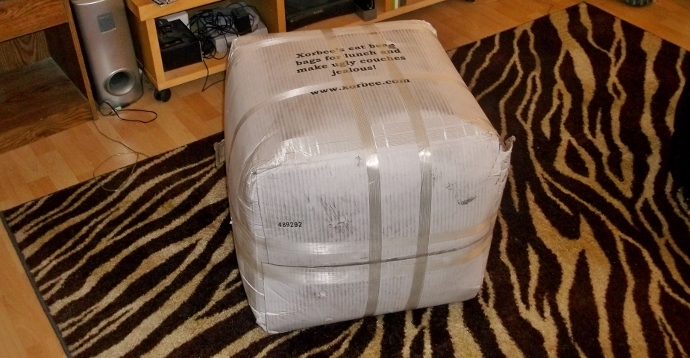 We received an Xcaliber, Rounds, Xorbee with Cranberry Red Microsueade cover for official testing in our living room. At near 6" in diameter, this king sized lounger is suitable for seating 3-4 young children, or one 'Jabba The Hutt' sized adult (as the site brags). Twill covers are included in the initial investment price, though Microsuede proves easier to maintain and clean in the long run, and is much softer in my opinion (for the minor additional upgrade fee). Of course, when ordering your Xorbee furniture, you can always choose to invest in alternate cover colors and materials at a later date. When the Xorbee arrived I anticipated a fit from my UPS carrier; this took 2 men to haul up the stairs to our condo, well over 40lbs when compressed into a box 1/5th it's expanded size. Just looking at the swollen shipping container made me nervous to unleash the beast within. Thankfully there are several great customer submitted 'unboxing' videos to guide you through expectations and handling tips. You'll also find a simple visual guide for unpacking the foam material, and 'dressing' the interior sack with your cover. At first glimpse, the Xorbee was a giant, medical blue, crinkled ball of material; all of the air carefully suctioned out of the containing wrapper for shipping. I was grateful the foam sack didn't expand as rapidly as I'd anticipated, once the exterior packaging was pierced. In fact, there was plenty of time to peel the plastic wrapper off and set the expanding ball into the cover prior to massaging the foam to relaxation. Once we'd zipped our Microsuede cover over the Xorbee it was easy enough to 'roll' the Xcalibur over, so the seam was against the floor, and continue massaging the clusters of foam pieces. During this process the once moderate sized ball seemed to expand like a muffin top over the rim of a baking tin, taller and wider every second. The excitement seemed to build every second, while the 'beating' of the foam clusters' wore out excess energy from all of the holiday sugar (I decided to unleash this monster just after Christmas). It should come as no surprise that I was, in fact, the last one to actually lay or sit on the Xcalibur, with one very enthusiastic adult, and wide eyed 10 year old promptly plopping onto the giant Red blob. The Xorbee, for now, has replaced a giant 5" square ottoman we'd previously had in front of our couch. It's not the most design friendly (as it's width expands when occupied), but I've yet to convince anyone that it should be relocated- it's truly the highlight of our home when guests or children are over. Sabrina plops into the middle of if after school each day and does not budge until I (usually wake her up) after homework around 6. As big as the Xcalibur is it is also very versatile in use; I can reshape the foam structure into a giant lounge chair, or prop it up against the corner of the living room as a couch, when I need the space. Moving it is certainly easier with 2 adults, but also manageable on my own; and the microsuede has proven a wonderful investment with kids and pets constantly climbing on it. There are many fun uses and stories surrounding this unique piece of furniture I look forward to sharing with you, so look for more Xorbee posts soon, and keep an eye out at Spring Fling for a very special giveaway! What Daughter Says: The Xorbee is modern alternative furniture perfected; with endless lounging possibilities and an extended life that justifies the investment! I wish these were around as a kid! As Required By the FTC: We received a floor sample from Xorbee for the purposes of our review series. No other compensation was provided. Regardless, all opinions expressed are unedited and honest. I used to have a green bean bag when I was small, I loved it...this Xorbee looks really comfortable!! I can see how my grand son would love to have one of these as his 'gaming' chair. This would be a nice addition to his room. My daughter wants a bean bag badly! I love that this is in red. Incidentally, love your rug, too! 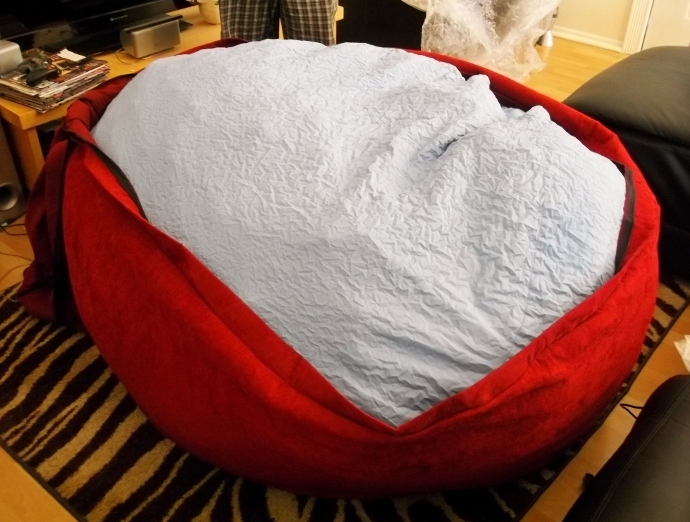 I also always wanted a bean bag but my mom never got me one. This looks very comfy! My kids would LOVE 2 of these so they would not fight over one. I love a good ole bean bag. That looks so comfy! bean bag couch - Here you will find top quality bean bag chairs filled with brand new foam manufactured in the USA. Beanbags are always the best place that gives comfortable seating and sleeping. I really liked it. 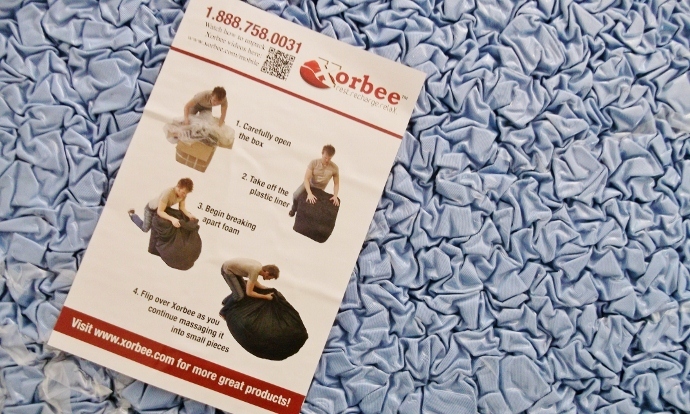 There are outdoor bean bags that come with a liner which can be easily removed and cleaned. 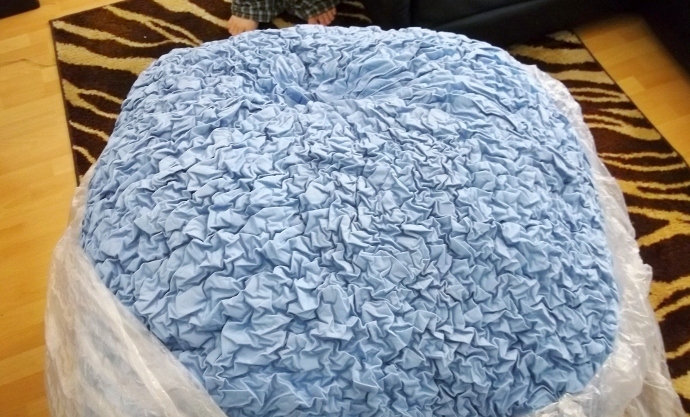 This will be the ideal bean bag chair for kids. bean bags are good with best price.